Transit planners for the Minneapolis – St. Paul region are designing a hub and spoke rail system centered on Minneapolis. Primarily LRT based, the Blue Line (Hiawatha) is complete, the Green Line (Central Corridor) is largely complete. The Green Line extension (SWLRT) is having trouble, and the Blue Line extension (Bottineau) is a few years away. This plan creates a strong east-west axis through downtown on LRT, and a lesser North-South bus axis on the Marquette/2nd (Marq-2) corridor. Nicollet, Hennepin, and other streets also have bus service. The city is proposing a streetcar line from Central in NE down Nicollet to Lake Street. There are also other streetcar lines proposed subsequently (down Hennepin, in the Midtown Greenway, among others). Mick Hicks in a recent Streets.MN post argued in favor of looking at higher-capacity (grade-separated) transit lines, in particular within the City of Minneapolis, and pointed out the LRT extensions are essentially commuter rail. Can Minneapolis support higher-density transit lines, and if so where? In the map above (link), I create a fantasy transit map of where I think the primary corridors to consider better transit serving the Minneapolis hub. I have not done a demand forecast or B/C analysis, but these I posit are likely to emerge as dominant corridors. Under certain overall transit demand patterns due e.g. to more expensive automobile travel because of higher gas prices, congestion pricing, high parking costs, lower incomes, etc. they might even be financially sustainable. On the map, the Blue line extension remains essentially unchanged, but everything else moves some. While I think Broadway in North is a better corridor for demand, it would also be much costlier to construct (unless someone was willing to get cars off Broadway, as has been done in Manhattan’s imitation Broadway). The Green Line extension follows the Blue Line extension down Olson Highway (55). This saves the Morass of the Kenilworth Corridor, lowers total distance needed to be constructed, and creates double-frequency service on Mn 55. I don’t think this is as good a corridor for Minneapolis or overall ridership as the next two lines, though. A new “Purple line” is created from Rosedale to Southdale, through the University of Minnesota St. Paul, along the under-used UMN transit-way, into the Dinkytown Trench, down (and perhaps under) Nicollet in a Seattle-like bus tunnel, down the Midtown Greenway, to Excelsior, France Avenue, past 50th and France, through Southdale, and then past I494 for a giant Park and Ride lot at its terminus. I envision this as a Busway on exclusive right-of-way, with electrically powered buses for the both the Midtown Greenway and the Nicollet Avenue corridor. Running under Nicollet is controversial, and expensive, but if any place in the Twin Cities requires a subway (besides the airport), it is Nicollet, with its line of skyscrapers feeding demand. Running buses in the trench is also controversial, but as I note elsewhere, electric buses can be just as nice as Streetcars, and far more flexible with routing. A new “Pink line” running from Fridley to Saint Paul shares the Nicollet “Bus Tunnel”. This follows the Minneapolis Streetcar starter line, running from Central Avenue in Fridley, just north of I-694 (again a giant park and ride lot), through Hilltop, Columbia Heights, East Hennepin, into the Bus Tunnel, emerging at the Midtown Greenway running east, crossing Hiawatha, into St. Paul along the railway tracks and Ayd Mill Road, to Grand Avenue, into downtown St. Paul on 7th. While this parallels the Green Line, it serves a largely different market south of I-94. New Routing Opportunities. 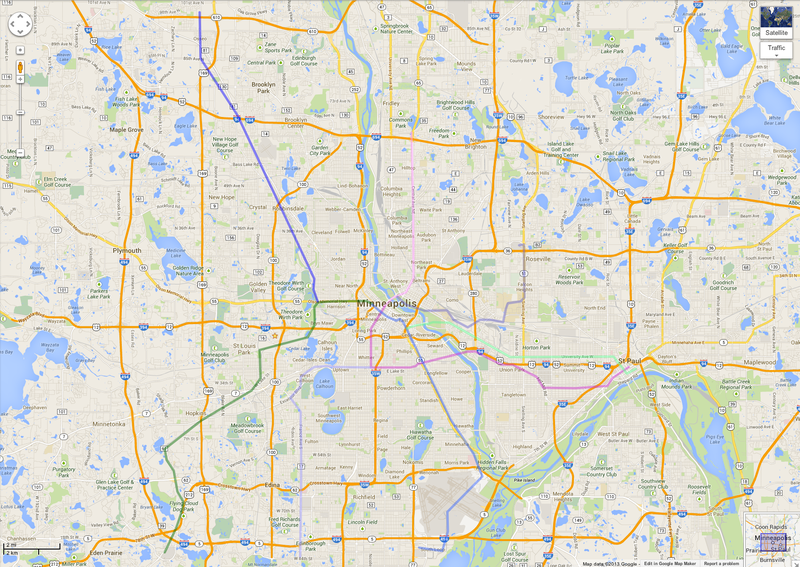 Transit operators could inter-lace the Pink and Purple lines, so every other train funs from Fridley to Southdale, or Rosedale to Saint Paul, or Fridley to Rosedale via NE, or Southdale to St. Paul via Uptown and Midtown. Since the Midtown Greenway would be an electric-busway, buses could run from the purple line and the Southwest lines to the Hiawatha, not requiring a transfer at the new Lake/Nicollet branching point. One key point is US cities with better transit services are more populous and denser. Seattle is similar to Minneapolis, just larger, while Washington and especially San Francisco are denser. On the other hand, when BART and the Seattle Bus Tunnel were being planned, those cities were a bit less populous. Seattle had 493,000 in 1980. San Francisco had 740,000 people in 1960. (In contrast, DC has depopulated from its peak, In 1970 DC had 750,000 people.) So a larger population requires better transit to move around, but building better transit does not guarantee a larger population (transit is necessary but not sufficient for a large core city). The plan sketched above does not solve Hennepin. In the end, I think that is a secondary corridor to Nicollet, and you probably can’t build both at high capacity (on-road streetcar is not high-capacity). Unless there is a will to close Hennepin to traffic, there will need to be tunnels under tunnels to provide high capacity service there (which is just expensive, not impossible). This does not include a completion of my proposed Circle Lines either (1, 2, 3, 4), which clearly won’t draw the level of traffic as radials serving the city center. These lines are not entirely original of course, some bear resemblance to the transit plans for the region of the 1960s, 1970s and 1980s. Minneapolis as it is now could not reasonably support large expenditures. A Minneapolis closer to its 1950 peak population of 521,000 (and a Twin Cities metro closer 5 million, if not 10 million), would need a much larger transit system. Electrified buses (partly in tunnels)? Wouldn’t this (1) eliminate the flexibility and cost advantages of buses, and (2) eliminate the capacity and superior ride advantages of streetcars? Seattle bus tunnel does this. (1) Electrification will be more standard, and may include hybrids or electric wire, as well as battery buses. The alternative (diesel) requires a lot of venting. The other alternative (streetcars) requires laying tracks everywhere to be able to act as a feeder system without transfers. (2) Capacity advantages of streetcars are largely non-existent unless you go to 3 car streetcars, which are not going to be running on shared streets in Minneapolis. Capacity advantages of streetcars are non-existent? The majority of the Metro Transit fleet is currently the Gillig Phantom diesel bus, about 40 feet long. The New Flyer D60LFR (our best articulated bus, I believe) is 60 feet long (See: http://twincitiestransit.blogspot.fr/2010/06/2010-new-flyer-df60lfr.html). Trams, like buses, vary in size. The Siemens Avenio, for instance, varies between 18 and 72 meters long. Still, this means that the shortest tram is about as long as the longest bus. The much derided (as too small) Portland streetcar, for instance, is 66 feet long (See http://en.wikipedia.org/wiki/Portland_Streetcar#Current_fleet). The latest trams ordered by the Munich transit authority are 36 m – 118 feet – long (See: http://www.mvg-mobil.de/presse/2012-09-28_mvg-pressemeldung.pdf). This is pretty standard. The 1-car, 2-car, 3-car permutations available to LRT are not a helpful guide here. The only way streetcars would not have a capacity advantage is if Metro Transit ordered the absolute smallest trams it could purchase. Even then, it would be about even with an articulated bus. In short, streetcars have a sizeable capacity advantage. Double-deckers in bus tunnels while rare, are not infeasible, and if one were clever, you could board at mid-deck or board both decks separately at not much added cost. The height of 4.4 m would have to be considered in tunnel design. Double decker electric buses in tunnels with upper deck boarding? This is getting a wee bit goofy. Trams can hold more people than buses because (1) they can be longer because they don’t make sharp turns and (2) their steel wheels on rails generate far less friction than tires on asphalt so they use less energy to carry more people. It’s not rocket science. Let’s not be seduced by the chimera of exotic bus technology. BRT plans will get “Red-Lined” (vaingloriously dressed up as rapid tranist while functioning primarily as road improvement projects). The thesis of the “Rail Identity Crisis” post is right; we need to stop with the politically low hanging fruit and design sensible, long-lasting projects that create a truly urban high capacity network. Why run the purple line down France instead of continuing south on Nicollet, a much denser corridor? My view is that Nicollet is too close to the “Orange Line” I-35W Freeway BRT to get any love as a high-capacity transit corridor. Certainly there should be transit on the corridor, maybe Arterial BRT, but it can’t be mostly if not entirely in a separate Right-of-Way south of Lake Street with the Orange Line a few blocks away. On capacity, the general point is that vehicle capacity is not what is constraining the existing system, it is lack of good transit-only or transit-first rights-of-way. If we get to the point where vehicle capacity is the problem, we have already won. Nicollet is a more proven corridor, with Hi Frequency service today until 66th Street (and 15-minute service almost all day to American Boulevard). It is close to 35W, but only between Lake St and the Crosstown Hwy. Assuming current transit service is a reflection of ridership, Richfield has far more demand than St. Louis Park, Bloomington or (!) Eden Prairie. It is very frustrating that these farther-out communities with less ridership and lower density continue to see investment — fantasy investment and real money — when Richfield is neglected. I agree Richfield deserves more service. But it should have it with the existing infrastructure. That the Red Line or Orange Line aren’t doing what we want is not the fault of the physical infrastructure, (except to the extent the Orange Line isn’t yet officially opened and Lake Street station isn’t yet in place), it’s the fault of the services operated, which should be local collector buses feeding onto the BRT into the core. local feeders jump onto the Busway into Central Ottawa. Like many Canadian cities, transit it Canada outperforms the US. Ottawa has a mode share of 23%. Unlike Vancouver or Toronto, it does not rely on rail, but does this with bus. Downtown of course is government, so probably has a significantly higher share of employment than Minneapolis of the region. On the other hand, Ottawa is a much smaller city, with a metro population of under 1 million. Hold the phone; wasn’t the “Rail Identity Crisis” article cited at the top of this article critiquing projects that “are no longer urban transit projects, but are instead commuter or regional services in disguise”? The Orange line is precisely one such project. It only has two Minneapolis stops that are not downtown (Lake St, 46th St; See: http://metrotransit.org/metro-orange-line). More importantly, it runs down a freeway. Running transit down freeways makes absolutely no sense. The whole point of transit is that the trip begins and ends on foot. Running a bus down to Burnsville is emphatically not a high capacity transit line. These lines suffer from the Met Council’s desire to geographically disperse transit. While politically understandable, it is not operationally practical. Most transit rides originate and terminate in the urban core. Connecting close-in destinations with proper transit corridors is sensible (and cost effective) policy; extending transit to exurbs whose entire design is antithetical to transit use is not. Yes, the Orange Line has only 2 Minneapolis stops along the route. That is not the important part, I don’t imagine too many people boarding by foot there, some transfers perhaps. The important part is the line-haul, the ability (if the region take advantage of it) to move vehicles rapidly across town. So a local bus fills up in Richfield, or South Minneapolis, gets on the Orange Line, and then disperses passengers in downtown at one or two stops. (And the reverse). Each local bus can run at frequency supported by local demand. If the Richfield bus can generate enough traffic to run every 15 minutes, it will run every 15 minutes. The network design trade-off is speed vs. frequency. Pooling the demand spatially (at one time) or pooling the demand temporally (at one place). You could have a more frequent bus that serves a larger market, but has more stops, and is thus slower. You can e.g. pick up travelers every 15 minutes for a 30 minutes ride into downtown. Or you can have a faster bus that runs at a lower frequency, picking up travelers every 30 minutes at fewer stops and can use the BRT facility for a 10 minute ride to downtown. Neither is morally preferable to the other, they are different services. One is more locally (and non-work trip) serving, one is more commuter-oriented. I disagree that a local feeder from South Minneapolis onto a busway into downtown is not urban transit. It is just a different form. As all readers of this blog I am sure understand, Land density allows you to increase both frequency and speed, as the market for services grows. The Twin Cities is not yet as far along on the dimension of density to justify as much service as we might want. Even New York and London and Singapore don’t have all the service they want. The question posed by this article was whether Minneapolis can support high density transit lines (and if yes, where should they be). A bus on the 35W is not a ‘high density transit line’, no matter how many feeder lines it has. I disagree that the speed vs. frequency trade-off is an ambivalent one; when we are talking about ‘Urban Transit in Minneapolis’, the balance tips in favor of frequency. Distances are shorter in the city. If riders are only traveling two or three miles, the bus or train should come frequently, not every thirty minutes. Indeed, it shouldn’t be necessary to memorize the schedule, because (1) there isn’t going to be one printed at your bus stop, and (2) the next one would ideally be coming in just a few minutes. A transit system fails in its basic function if it doesn’t allow you to miss the bus or train (and still be on time if you catch the next one). People aren’t rational benefit maximizers with up to date information and a dispassionate analytical disposition (economics-speak for the ideal man). They forget something just as they’re leaving the house and they need to rummage around the kitchen for two seconds before they can leave for work. Such basic daily occurrences make high-frequency transit necessary. You need to be able to depend on it when you need it. A service that fails in this regard is viewed, justifiably or not, as unreliable. Exactly. What makes Portland’s transit system work so well is not only the light rail lines (five and counting), but the fact that buses run a minimum of every 15 minutes seven days a week on arterial streets. It’s because of frequency and dependability that I was able to ride transit from a near-downtown neighborhood to a community college class that started at 8:30 on a Saturday morning in a second-ring suburb. I took light rail to the nearest stop and then the bus that met the train and ran to the community college campus. Tokyo’s system, the gold standard as far as I’m concerned, runs commuter trains and subway lines every 3 to 8 minutes, depending on the time of day. Trains to distant suburbs and satellite towns? Every 15 to 30 minutes. If I were the Metro Transit planner, I would concentrate on running buses every 15 minutes on all arterial streets, both north-south and east-west. I would also remove the rush hour surcharge, which penalizes the most frequent riders, and replace it with a distance surcharge, which would kick in if you traveled outside the city limits of Minneapolis or St. Paul. Given more funding, I’d extend the Hiawatha Line from Anoka to Lakeville and the Central Corridor from Wayzata to Stillwater, then build two diagonal lines from Maple Grove to Hastings (through downtown St. Paul) and from Forest Lake to Eden Prairie. I’d top off the system with a loop line that linked the old downtowns (Hopkins, Robbinsdale, Edina, White Bear Lake) and major shopping centers of the older suburbs. Talk about density is an anti-transit distraction. If you look at most neighborhoods within the city limits of Minneapolis and St. Paul and the inner suburbs, at least the neighborhoods that were plotted or built before World War II, you see plenty of density. Nature didn’t build America in one-acre lots interspersed with strip malls: highway-oriented construction did that. Yeah, why Metro Transit doesn’t do distance pricing is beyond me. The riders furthest away are the most expensive to serve, so naturally they should pay a higher price. But Metro Transit’s pricing in general is off. $2.25 for a local bus during rush hour is very high. The result is that Minneapolis and St. Paul riders pay a high price to go a short distance so that suburban riders can pay a marginally higher price ($3) to go much longer distances. Before Metro Transit was part of the Met Council, it was a separate entity called the Metropolitan Transit Commission (MTC) and it did have distance pricing. There were several fare zones, as I recall. Rush-hour pricing is problematic (especially from a general transportation perspective) since it penalizes people for riding the bus when we as a region most want them in a bus, and not in a car. It would perhaps be justifiable if we had congestion pricing on roads, but since we don’t, it just makes it more expensive to not drive your car during rush hour. Ridiculous. Distance pricing is problematic, too, though. First off, the city limits of Minneapolis and St. Paul are pretty arbitrary from a transit perspective, especially when the inner-ring ‘burbs have essentially the same density as equivalent suburban areas of Minneapolis and St. Paul. There are also network considerations: the 5 connects at Mall of America to the 54 (St. Paul) and Blue Line (eastern Minneapolis). Should riders from South Minneapolis making either connection be penalized because the connection point is in Bloomington. And I don’t like the idea even of distance pricing even for more clearly distant ‘burbs, for the same reason stated above for rush-hour pricing: we’re discouraging ridership for the people we most want to start riding the bus. Don’t get me wrong: it’s a little messed up that someone can drive his car in Apple Valley to free, covered ramp parking, leave it there all day, and take the bus 20 miles to Mall of America and pay the same fare as a regular transit rider taking the 18 one mile in Minneapolis. But since the Apple Valleyite is not asked to pay the fare cost of the other transportation options (driving), why should we discourage him from taking mass transit by asking him to pay a fuller cost of that? Er, the fair cost, that is. Hehehe. Sorry, I have to agree with the Coalition, streetcars are much better there than buses. I know your down on streetcars (as are a lot of urban planning people) but what it seems your proposing is something between streetcars and LRT (at least LRT here). I can see these lines as faster streetcars (own ROW) with 2/3 cars. Streetcars with exclusive lanes — but at ground level, crossing cross-streets at grade — are “light rail”. Light rail doesn’t have to be as gold-plated as the University Avenue route. You don’t need to rebuild the entire street from “building face to building face”, and you don’t need to relocate every utility line. It gets much cheaper if you don’t overdo it. University Avenue needed a street rebuild, but it was unfair to treat it as part of the light rail project. Now, I think it’s very important that in any congested area, streetcars should get their own lane. But that is not an argument against *streetcars*. An argument could be made for 6th St as well.